Does A Messy House Make It Harder For Your Kids To Learn To Read? Everyone has a messy house from time to time. However, if household chaos reign most of the time in your home does that mean your kids will have a tougher time learning to read? The Academic Study: Order In The House! Those two things don't necessarily sound intuitively linked together, but a study from Columbia's Teachers College entitled Order in the House! Associations among Household Chaos, the Home Literacy Environment, Maternal Reading Ability, and Childrens Early Reading studied the effect of household order on children's reading skills, and what they found is rather surprising. 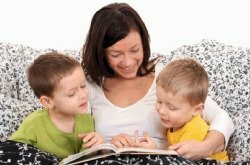 The abstract of the study states that in households where mothers were above average readers "the degree of household order is significantly and positively associated with" early reading skills. What Does Household Order Mean? I could not find an entire copy of the academic article itself, but Emily Bazelon of Slate Magazine has read it in its entirety, and in her article, Messy House, Messy Minds, she stated that "It's clear that by an 'ordered home,' [the researchers] do not mean a spotlessly neat and clean one." That, of course, is a sigh of relief for any parent who has struggled to keep the house as neat as a pin while tornados, i.e., children, are around. On the other hand, it appears that what is meant by an "ordered home" has more to do with what is termed in the article "executive function." The term "executive function" was never really defined by the Slate article, but I have understood it to mean basically routines and schedules, such as bedtime routines and morning routines. If that is in fact the case it really isn't so much about having an absolutely clean home versus a messy house, but more about having an ordered and predictable home environment. The results of this study are not, however, a reason to beat yourself up if you don't have perfect routines in place, or if you have a messy house. First, no one is perfect. Second, there was another interesting part of the study. The study found that for children with mothers who were average-ability readers household order was not as important as "the number of books a child owns or brings home and how often a child amuses [them]self alone with books." Third, as with all scientific studies, it has been cautioned that "the findings are preliminary" so keep them in mind, but do not base your life or your children's lives around them. Basically, what I have taken from this article is twofold: first, that it doesn't hurt to keep a bunch of books around for your kids to read on their own, and second, that this is just additional proof that kids thrive with routines. Plus, the added bonus is that not only are routines good for kids, but they are good for you as well. Routines and schedules are such an important part of household management, not only for kids, but also for adults. For example, I've already discussed why a laundry schedule and weekly cleaning schedule are important. Who knew that when we were tucking the kids into bed at 8:00 p.m. sharp that we were helping instill the reading habit in them?